Morristown NJ – Using some of the latest technology and advanced techniques such as computer imaging, digital x-rays, and dental lasers, Dr. Edward Romano and Dr. Robert Bizzarro aim to give the patients of their New Jersey cosmetic dentistry practice state-of-the-art care and beautiful smiles. With that in mind, Dr. Romano says, recent innovations such as the CEREC® system have significantly improved the efficiency of treatments such as porcelain veneers and dental crowns – options that can help many patients renew common dental imperfections with long-lasting results. He notes that CEREC® technology can ultimately save patients extra office visits and the inconvenience of temporary restorations by giving them the permanent restoration on the same day. 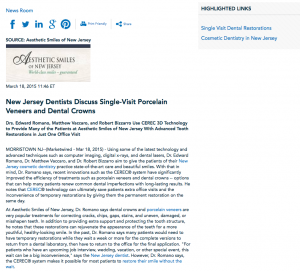 At Aesthetic Smiles of New Jersey, Dr. Romano says dental crowns and porcelain veneers are very popular treatments for correcting cracks, chips, gaps, stains, and uneven, damaged, or misshapen teeth. In addition to providing extra support and protecting the tooth structure, he notes that these restorations can rejuvenate the appearance of the teeth for a more youthful, healthy-looking smile. In the past, Dr. Romano says many patients would need to have temporary restorations while they wait a week or more for the complete versions to return from a dental laboratory, then have to return to the office for the final application. “For patients who have an upcoming job interview, wedding, vacation, or other special event, this wait can be a big inconvenience,” says the New Jersey dentist. However, Dr. Romano says, the CEREC® system makes it possible for most patients to restore their smile without the wait. CEREC® milling technology allows Drs. Romano and Bizzarro to plan and create custom restorations in a single office visit. First, 3D computer imaging technology is used to map the oral landscape of the patient, helping to create a precise fit for the restoration. “With an in-office milling unit, your custom-made veneer or crown can then be created onsite within an hour,” says Dr. Romano. As soon as the restoration is complete, the dentists can match the shade of the veneer or crown to the natural teeth and apply the restoration to the affected tooth that same day. Without the waiting period required by many other practices, Dr. Romano says his practice is able to offer long-lasting smile restorations while saving their patients valuable time. Dr. Edward Romano earned his Doctor of Dental Surgery degree at Georgetown University School of Dentistry and has decades of experience as a cosmetic and restorative dentist. Dr. Romano is an educator and lecturer who has delivered presentations at meetings of the American Dental Association, and he serves as an attending dentist at Morristown Memorial Hospital. Dr. Romano has also been featured on many media programs, including Dateline NBC, CNN, and MSNBC. He is available for interview upon request. Dr. Robert Bizzarro received his Doctor of Dental Medicine degree from the University of Medicine and Dentistry of New Jersey. While at the dental clinic in Morristown Medical Center, Dr. Bizzarro completed his internship and general practice residency under the supervision of Dr. Edward Romano. He is a native of Green Brook, New Jersey. Dr. Bizzarro is available for interview upon request. For more information about Dr. Romano, Dr. Bizzarro, and Aesthetic Smiles of New Jersey, visit nationalveneerdentist.com, aestheticsmilesofnj.com, and facebook.com/aestheticsmilesnj.